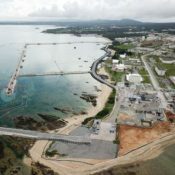 An event to commemorate former governor of Okinawa and emeritus professor at the University of the Ryukyus, Masahide Ota, who passed away in June, 2017, was held in Naha the evening of June 12. He died at the age of ninety-two. The ceremony was held at the Prefectural Center for Equality Tiruru on the anniversary of his death. 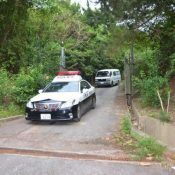 On June 21 at about 2:00 p.m., an object resembling a bullet was reported found at a small work cabin in an orchard in Sukuta, Nago City. No one was injured, but two panes of glass in the cabin were damaged. 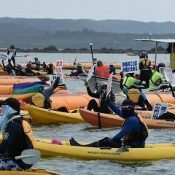 A team of about 70 vibrantly colored citizens’ canoes face the Japan Coast Guard’s black inflatable boats, separated by an oil fence. 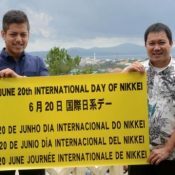 On June 6 and 7, the Association of Nikkei and Japanese Abroad held their 59th Convention of Nikkei and Japanese Abroad in Hawaii. 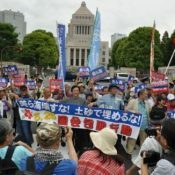 Here, the association established June 20 as International Day of Nikkei. 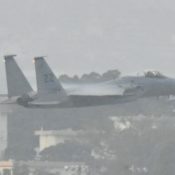 In the early morning on June 11, a U.S. F-15 fighter aircraft from Kadena Air Base crashed in the ocean to the south of Okinawa Island. 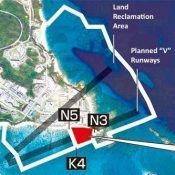 The Japanese government is making arrangements for land reclamation work in Henoko, as part of construction of the replacement facility for Futenma Air Station. 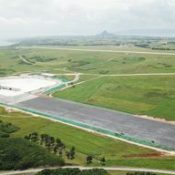 At Ie Jima Auxiliary Airfield in Ie Village, expansion work is proceeding on the “LHD deck” airstrip, which simulates the deck of an amphibious assault ship. 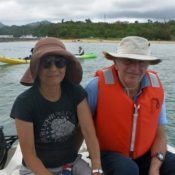 On June 5, former Canadian diplomat who currently lives in Vancouver, Terry Greenberg, 72, and his wife Yoko Oikawa, 59, attended an at-sea protest for the first time.